Finally found and ordered a P365 from Bud's on Friday (only place that had one). According to Fedex tracking it should be at my FFL today. Can hardly wait to get it and get to the range. Now I need to find a good IWB holster for it. I ordered the Silent Thunder Fusion from Garret for mine. Hoping it will be here this week. Congrats. I had mine out again yesterday for another few hundred trouble free rounds, love it so far. Still debating on holsters though. I have a silent thunder for my PPS, might go that route again. VEDDER HOLSTERS are relatively inexpensive (these days) with a fast return. I agree with AZ excellent holster. Congrats. You are blessed. I'm still waiting for my backorder from Brownell's. I didn't realize 365 was the wait time, in days. I'd like to buy the 12 rounders' and holster, but it'll just gather dust & really tick me off to have the holster sit vacant. Looked at Garret and Vedder holsters. I have tried kydex IWB before but just didn't work out for me, so I am looking for leather. I set up email notification with 4 different online places I have bought guns from in the past. But I still checked them everyday. I set up for nite sites but the one I found has X=Ray sites. Decided I was lucky(?) to find that one so I got it. 12 round mags in the future. I picked up a Clinger IWB holster. Now I have two 12rd mags and a holster for the P365. Which Brownells still has not shipped from my 2/1 order. Every time I get the in stock notification from Top Gun Supply, I'm already too late. I just picked up one of their OWB holsters and a single mag pouch. Quality stuff! 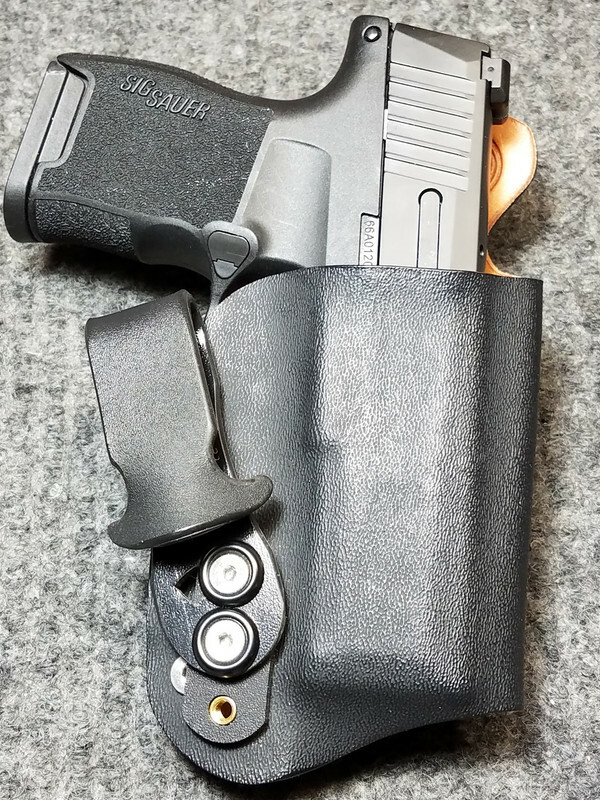 They have several styles of Kydex and leather holsters, and I have two of their tuckable Kydex IWBs for my P320C and my brand new P365. The IWB clip on Muddy River’s holsters are the best I’ve had. I do encourage you to check them out before buying elsewhere. Have been looking through the list of holster makers stickied in the CCW section. Found one at Hign Noon Holsters that is on my mind as I finish going through the rest of the list. I have a DeSantis pocket holster for mine. Works great. It won't get carried until it's got more rounds at the range, though. Another trouble free hundred rounds this evening. If it keeps on shooting like it does, it will be a favorite. Easy to shoot quickly, easy to control, and sole complaint (not really a complaint) is that the pistol is small enough that magazine's need to be extracted with the free hand, to go fast. Easy enough to do when coming up with the fresh mag. What does "tuckable"mean in an IWB holster? I can't figure out what tucks and how. A tuckable holster allows the overgarmet (eg, t-shirt, etc) to be tucked into the waistband, betwen the holster and the pants. The shirt appears tucked in all around, and conceals the pistol under a tucked shirt. Usually the shirt is left with a bit of loose fabric around the belt; this gives a bit of play when bending and moving so the weapon doesn't print as easily, and gives something to grasp to retract the shirt when drawing the pistol. Generally inside the waistband, I prefer an untucked shirt, but I've often gone tucked with a pistol inside the waistband. If I have a tucked shirt and am not carrying in the waistband, then I carry on the ankle and/or in the pocket with a pocket holster. Garretts makes fantastic holsters with a very short lead time. For my P365 I chose the Silent Thunder GT. The offset clip makes it a tiny bit thinner which is exactly what I was looking for. I modified the clip a bit to make it more concealable. I ordered mine on 1/31 from Brownells and it shipped today 6/6. PM9, can you show the other side of your holster, please? I was just at the local gun shop tonight and they have one on the shelf I am sure they would ship if anyone is interested. Green Mountain Guns in Denver has a used one on consignment for $495.00 X-Ray sights and 4 mags. I have no affiliation with GMG other than being a regular customer. I wish I looked as good as I feel. I'm glad I don't feel as bad as I look.